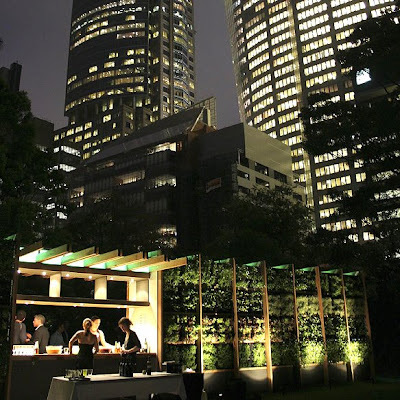 If it's not landscaping on buildings or ecologically planning communities around the globe, it must be the buzz-concept of Urban Agriculture - and it's had a lot of press lately. A lot of press. And deservedly so - as the new face(s) of agriculture seem to be collecting into teeming masses with some traction towards big changes. 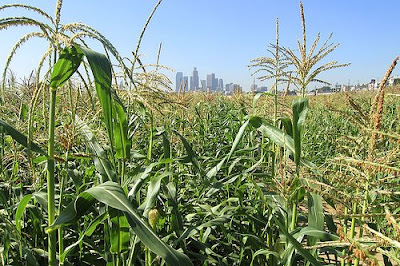 Rather than focus on the new press, let's starting with an art/ag piece from a few years ago, 'Not a Cornfield' by Los Angeles based artist Lauren Bon. 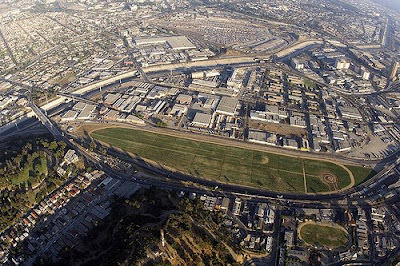 These ephemeral installations are great opportunities to both occupy blighted lands as well as the ability to reconnect residents to their agricultural pasts. A Portland project endeavoring to identify urban agriculture opportunities is the Diggable City, which identified available lands within the city for production. As I have mentioned previously, the opportunities to occupy available lands in urban areas for agriculture (on land, rooftop, and perhaps even facade) is a great multi-functional chance to provide self-sufficiency and interpretation. As far as buzz goes, the terminology zipping around the, for lack of a better pun, crop circles - includes a number of new members of the agri-lexicon. One of my favorites is locavore, and a variant, the "100-mile diet" were recently profiled on Treehugger in a great post: "Green Basics: Local Food"
The post is worth a close read, and also has links to a number of local food resources. While we often use these terms, it's good to re-evaluate the ecological values embodied in the concept. The article adds: "The concept is also defined in terms of ecology, where food production is considered from the perspective of a basic ecological unit defined by its climate, soil, watershed, species and local agrisystems; everything together is defined as as "ecoregion" or "foodshed." Ah, a couple of other terms, one that is getting much use is "foodshed". A new term, right? Well, not exactly. Adapted from the ecological concept of watershed, the term was coined in 1929 to: "...describe the flow of food from the area where it is grown into the place where it is consumed." (via Wisconsin Foodshed Research Project). 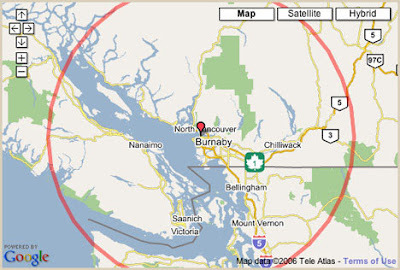 The exact radius varies for the distance of acceptable food miles traveled, but just for kicks, strike a 100 mile circle around your house, and consume from just this area. Now do this in Houston - or Phoenix - or Fargo. It is possible, but not necessarily easy. Another term that was pointed out to me in a comment to previous post involving the significant carbon sequestration potential in soils. The latest term picked up recently by Treehugger, involves biochar (aka agrichar, terra preta) not just for Simply put it is: "...what you get when biomass is heated in the absence of oxygen through a process called pyrolysis. When incorporated into soil, biochar provides the structural habitat needed for a rich community of micro-organisms to take hold. 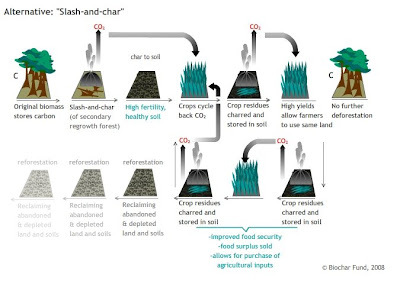 Incorporating biochar into soil can also act as a way to sequester carbon." What's the big deal? Again, multi-functional solutions. (via Treehugger): "Biochar is a classic win-win scenario, a solution that can provide us with a valuable tool for fighting climate change, world hunger, poverty, and energy shortages all at the same time." A number of new initiatives are capitalizing on the phenomenon, including the International Biochar Initiative and the Biochar Fund, both with some great additional resources. 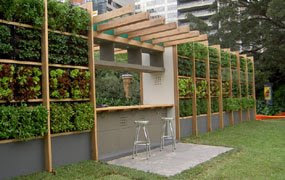 Finally, let's marry a couple of buzz-concepts - urban agriculture and vertical greening. A different scale than some of the featured rooftop ag gardens, this project preceded a multi-part post on My Urban Garden Deco Guide and the companion site 'My Urban Farm' as blogger Anne Robert bemoans the lack of aesthetics in the new wave of planters focussed around Grow Your Own veggies as new urban trend. One exception is a previous post on 'Salad Bar' which provides a new vision for facade-grown veggies in a more refined container. thx ! yep indeed it is quite a buzz : but not just in the green eco friendly community: the ultra trendy UK magazine wallpaper dedicated a whole paper on AGRICOOL and married urb farming ...with fashion brands a la Prada! But I am still waiting to see elite designers come up with cool designs that will put GYO in every magazine and help us really get GYO off the ground! Incase you wish to do a follow up story here are the current news and links on Terra Preta (TP) soils and closed-loop pyrolysis of Biomass, this integrated virtuous cycle could sequester 100s of Billions of tons of carbon to the soils. The Honolulu Advertiser: "The nation's leading manufacturer of charcoal has licensed a University of Hawai'i process for turning green waste into barbecue briquets." Genesis Industries, licensee of Eprida technology, provides carbon-negative EPRIDA energy machines at the same cost as going direct to Eprida. Our technical support staff also provide information to obtain the best use of biochar produced by the machine. Recent research has shown that EPRIDA charcoal (biochar) increases plant productivity as it sequesters carbon in soil, thus reducing atmospheric carbon dioxide. Just doing my avocation.........thanks for spreading the word. I believe we have a very comprehensive resource for all things Terra Preta... thanks Erich for the info and much good reading. As carbon-neutral gets kicked around more and more - it's good to have some science to back up approaches.